This video is about making home made Taquitos. Quick and easy to make. The kids will love this recipe! 2. Brown the meat on stove then add refried beans to it. Stir and cook until well blended. 3. Add monterey jack cheedar cheese. Mix in. Turn the burner off and then transfer it to another bowl and keep this filling aside. 4. Place a tortilla shell on a flat surface. Scoop some filling in the centre and then roll it up. 5. Repeat to make the remaining tortilla and place them seam side down in a casserole dish. 6. 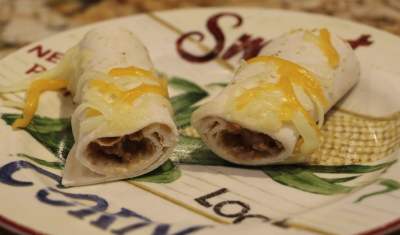 Sprinkle the colby monerey jack cheese all over the taquitos. 7. Cover the casserole dish with an aluminium foil and place the dish in the preheated oven. 8. Cook for aout 15 minutes and then pull them out. 9. Serve these taquitos warm. Enjoy.